Don’t let your corporate wellness program be the last thing you consider for next year. If you leave it on the back burner, your big ideas could be unsuccessful if not thoroughly planned. Start now, pull your team together, get out for a walking meeting and start forward thinking. 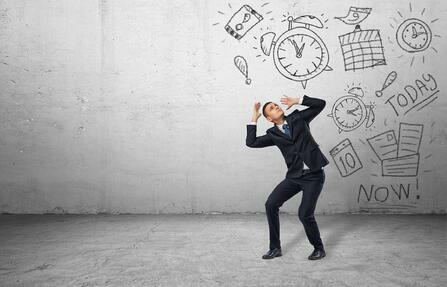 Evaluate the past year – think about the past 12 months, where are the natural ebbs and flows in participation in comparison to the work load of your employees? Most individuals gear up with big expectations for a healthier lifestyle in January, so make note because you have their attention! You may find that summer months slow down, people are vacationing, have family activities, or other barriers to participation. Knowing and having an awareness of the increases and decreases throughout the year will help you pin point where you should focus, or try something new to spike engagement and increase participation. What worked best – knowing your audience is key; how well do you know your employees and what motivates them to participate in wellness based offerings? Our corporate fitness staff build programs based on the needs and key motivators for their members. If you have a workforce that thrives on competition, create a program for departments to come together and encourage each other. Maybe your industry can be stressful at certain points in the year; offer stretch breaks, meditation moments, or activity centers that give employees a place to step away from their desk and re-energize. Not everything about your program needs to be fitness based, evolve your program! Map it out – grab a calendar and start planning. When you looked back on the past year, what were those key points in the year for participation? Mark your calendar. By forward thinking and planning for the year you know what is up and coming and can use that to your advantage. As one program is wrapping up its final week or days, you can start promoting the next program while you still have a captive audience. In those down months where participation was low, use those best practices where you’ve seen great success and modify it into a new program idea. Use what works for your employees to keep them engaged throughout the year. Plan to evaluate – if you don’t already, evaluate your programs. When planning a specific program, what is it you want to achieve? Set SMART goals and assess how you are going to get your employees to be successful. By knowing what you are trying to measure, or have employees achieve throughout the program will give you specific data points to collect to measure your success. Consider working to increase visits to your onsite fitness center, or have employees be more cautious of their blood pressure and taking steps to maintain healthy numbers. By making the goals SMART, you will have a measurable goal to strive for. A successful program doesn’t always meet every goal set. Always consider what did or didn’t work and how you can improve next time. Make notes to refer to when planning your next big program. Keep in mind when employees feel supported by their management team to participate, they are more likely to succeed. Have your key leaders behind your overall initiative and allow them to encourage employees to live and be healthier. 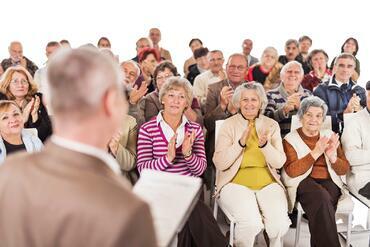 Click below to get our 5 Tips for Maximizing Employee Engagement. I shared a few months ago about our staff following the KISS principle (that’s “keep it super simple” in our world!) on an exercise-based program with one of our clients. (You can find out more about the NIFS150 corporate fitness program here.) I wanted to update you on that program’s outcomes and talk about our latest challenge. One of the outcomes we saw from that program was that a lot of the participants did not exercise in the corporate fitness center during the initiative, and frankly, that was by design. We were mostly interested in supporting and inspiring employees to achieve 150 minutes of activity each week, so we eliminated the “must be accomplished in the corporate fitness center” barrier by allowing participants to log any activity accomplished anywhere. 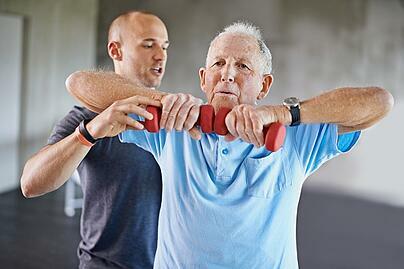 After all, the primary job of our fitness center managers and health fitness specialists is to get employees moving. If it’s activity in the corporate fitness center, even better. But with today’s frantic schedules, we’ll take any movement, anywhere, anytime. Hydration Lagoon: Drink 64 ounces of water each day of the week. Adventure Park: Try a new outdoor activity. Meditation Meadow: Practice meditation, breathing exercises, or stretches on four days this week. Fitness Fountain: Try a new group exercise class, DVD, or at-home workout. Traveling Trail: Accumulate at least 7,000 to 10,000 steps one day this week. Feel-Good Farm: Pack a healthy lunch three days during the week. Progress Paradise: Complete two fitness center screenings (BMI, circumference, blood pressure, body composition, resting heart rate, or body weight) this week. 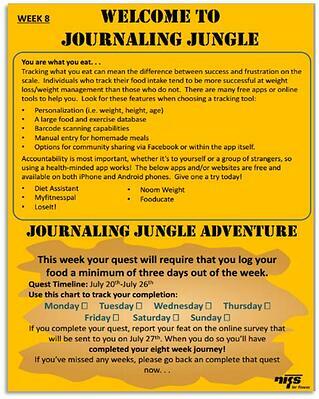 Journaling Jungle: Keep a food log for three days this week. As was the case with the NIFS150 program, our goal with the ASAP program was to make it accessible for everyone. It was promoted to all employees, including those who work at home. We ran it over summer months when it can be particularly challenging to attract employees into the corporate fitness center. The online registration and website access for weekly challenges made it simple for all participants to have the information they needed to be successful. And, in keeping with many of our programs, we offered prize drawings for employees who successfully completed all eight quests. Consistent with the “adventure” theme of the program, most prizes were experience-oriented (such as tickets to theme parks, state park passes, and surfing lessons) rather than stuff-oriented (such as wearable tech, shirts, and gym bags). In a post-program survey we learned that almost 84% of responders believed they adopted a new healthy behavior by participating in ASAP. And that’s consistent with their rating of “accountability to try something new” as their favorite program feature. Participants also reported learning something new about health during this program. Although weight loss was not a focus for this program, 43% of survey respondents reported losing weight or inches during the eight-week offering. Almost 60% reported having more energy, and about one-quarter of participants indicated that they were sleeping better. Through the post-program survey, we also gained valuable insights on how we can improve the program if we offer it again next year. Looking for more creative corporate fitness programming? Check out our best practice series by clicking the button below. In part 1 of this blog, I wrote about a program we offered that helped us address an area of opportunity for resident participation in our senior living fitness programs. One of the core messages from that blog was how important tracking participation data is, over time, for sustaining a truly successful program. There is so much more to a robust fitness program in senior living than hosting classes, offering assessments, and teaching residents how to use the equipment. Tracking participation data in your fitness services is crucial for any new or long-established program. In new programs, you need to simply start by keeping an eye on growth in membership and making sure participation steadily increases as you launch the offerings. In this blog, I’ll touch on some key numbers and trends you should be watching. An established fitness program you might consider “good” can become GREAT by tracking and strategically using participation data for continuous improvement. There is not an end date at which you cut off these practices no matter how old your program is. In addition to talking about data practices for new fitness programs, I’ll offer tips below from NIFS data trends over the past couple of years to show how you can use these practices to fine-tune an established fitness program. New members: Part 1 of this series covered NIFS Fitness Freeze and how the membership drive component recruited new participants to join the fitness center. NIFS has a new client in Lakewood, New Jersey, that began staffing with us in August 2014. Since our launch, we witnessed an initial surge in residents enrolling, and then the normal steady trickle of participants in the months thereafter. And then we ran the Fitness Freeze and it generated a record-setting surge in new members in a month to finish off the year. If you are tracking your new members from month to month, you can keep an eye on when membership or participation starts to trickle off or plateau and run a targeted campaign to rebuild your momentum. Participation frequency: We have another client in Mystic, Connecticut, that launched with us in May 2014. In addition to tracking their steadily increasing membership rates, we’re also following the percentage of residents who visit the fitness center 8+ times in a month. For this relatively new client, that percentage is steadily climbing as the membership percentage increases. This tells us that more residents are joining, and more importantly, they are adopting a consistent routine once they become members. Group fitness participation: We have a client in Stone Mountain, Georgia, that has had a fitness program and staffing since they opened their doors in 2004. NIFS started managing their fitness program in October 2011. Over the past couple of years, we’ve had a lot of success with participation growth in group fitness classes, and because our data offered proof of that growth, we were able to garner budgetary support for more instructors. In 2014, we added 11 new classes per month to the schedule, and the average number of participants per class each month stayed the same. 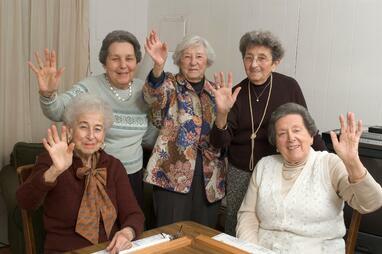 In short, we brought the residents more classes, and they took full advantage! Personal training participation: Another client in Phoenix, Arizona, is showing steady growth in their personal training program. In 2013, there were 302 personal training sessions conducted, and in 2014 there were 707 personal training sessions conducted. We’ve added personal training as a program option in their health center, and we are currently hiring another personal trainer to help keep up with the demand for that growing service. Membership rates: Lastly, three different communities that have been up and running with us for over five years all showed an increase of at least 4% or more in membership in 2014 compared to 2013, with little change in occupancy at those communities. Steady programming efforts targeted to spark different resident interests over time can help your membership continue to grow. Diversity in program offerings is what really drives that continual increase in membership, especially at our well-established communities. There are countless ways that you can track and evaluate participation data in your fitness program, and half the battle is just getting started. Determine what you want to track, how you need to track it, and then how you can effectively report that data over time so that it is usable and easy to evaluate. We aren’t statisticians with intricate spreadsheets spending hours crunching data each month. We do, however, have sound reporting methods so that our staff can gather this valuable data to continually build and evolve best-in-class fitness programs at the senior living communities we serve. 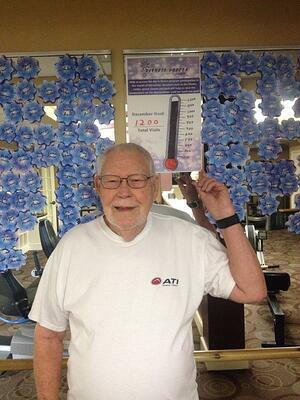 I’ve written in the past about how consistent tracking of participation data in your community fitness center can help improve and evolve your senior living fitness program over time. Here is a two-part follow up series on what you are missing if you aren’t tracking data from your program. These observations are built entirely on NIFS’ experience doing this work for our senior living client communities. Did your community fitness program experience a dip in participation during the busy holiday season? You’re in good company—we used to see that as well. But in 2014, we were able to reverse the trend thanks to a custom program designed to motivate residents to move more when exercise often takes the backseat to holiday parties and family gatherings. Total visits: An 11% increase in total visits to the fitness center and group exercise classes from November to December 2014 compared to the same months in 2013. New members: An 8% increase in new members signing up to participate in the fitness center from November to December 2014 compared to the same months in 2013. Appointment volume: A 26% increase in the number of appointments conducted from November to December 2014 compared to the same months in 2013. No elaborate tracking logs or point system: Residents don’t need one more thing on their “to-do” list, so keep it simple! Residents had to sign-in as they normally do to the fitness center and we took care of the rest. 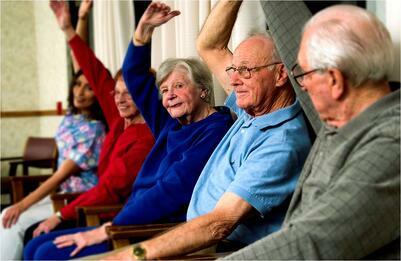 Our goal was to help residents be consistent in visits, even if their workout time was shorter than normal. 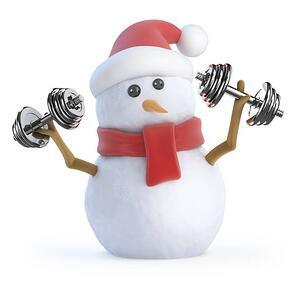 If a resident exercised for at least 10 minutes, three times a week, they earned a snowflake that hung in the fitness center with their name on it. 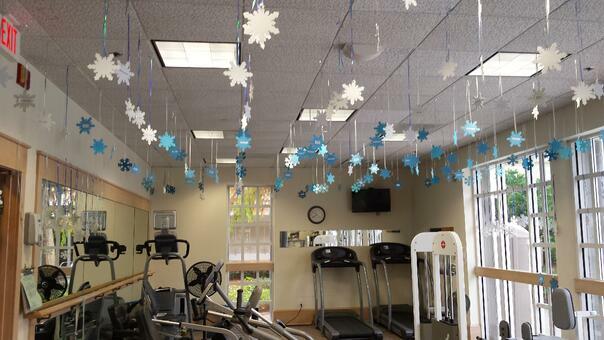 Make it visual: The individual snowflakes were a great way to decorate the fitness center with some seasonal cheer and residents LOVED being able to show off to visiting family and friends how many snowflakes they earned. It was eye catching, provided an easy avenue for discussion, and offered a constant reminder to the participants to stay on track. Recruit, recruit, recruit: As resident talk about the snowflakes on display in the fitness center spread throughout the community, residents who weren’t fitness center members yet learned that they could earn a snowflake just by joining in December. It created a fun and easy way for residents who might be on the fence about joining to take the final step and feel included among the ranks of our regulars. The Fitness Freeze was born out of our constant efforts to do better, which include a strong focus on data as well as routine evaluation of program effectiveness. Once we identified holiday-time as an opportunity for improvement, we built a tool to address that challenge. It’s a tangible and practical example of a targeted campaign to boost the participation in a given month. Watch for part 2 of this blog to learn about the value of evaluating data trends in brand-new fitness programs as well as in well-established programs from year to year. Checkout more great programming from NIFS Fitness Management with our Best Practice Series.